This model includes in-ground post mount, as shown. This mounts also includes a built-in timer in the post (black knob shown). After 3 hours, the gas supply is cut off, to help eliminate accidentally leaving the grill going! All AOG grills are manufactured right here in the good 'ol U.S.A. Some features are exclusive to the 24" model, like: 24 x 18 primary cooking surface with 432 square inches to cook a lot of food at one time! Plus it has a powerful 32,000 BTU's of cooking power AND 10,000 BTU backburner. The AOG Infrared Backburner System is constructed of INCONEL™ stainless steel to be more durable and makes this burner system heat resistant, corrosion resistant, easy to use and easy to clean. These uniquely styled stainless steel panels are positioned to vaporize drippings from the food being cooked, adding succulent barbecue flavor and aroma. 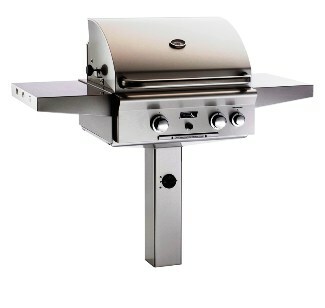 They are designed with oblong openings forming a diaganal pattern, providing optimum heat output and even heat distribution throughout the grilling surface while reducing flare ups and grease fires. These panels are built to easily accomodate wood chips or charcoal. Aids in precision control of grilling temperature. High quality commercial grade solid brass valves provide precise temperature control from 200F to over 825F at the grilling surface. These high quality valves allow for easy field conversion between natural gas and propane gas. This cart model also includes a Stainless Steel 12,000 BTU side burner with brass control valve and infinite control settings plus ignition system!